We'd love to show you how these Environetics flow-control systems improve your treatment process anywhere in Iowa or Nebraska. DIRECTORTM I floating baffles for ponds and lagoons make lagoon treatment more efficient and more effective. A custom-designed floating baffle system using the Director I helps make use of the entire lagoon - creating efficient flow patterns and increasing the effective treatment area. Each Environetics Director I floating lagoon baffle system is custom-designed and fabricated into a one-piece flow diversion curtain before being delivered to the site ready for installation. Installation can usually be performed in less than a single working day. By installing an Environetics floating lagoon baffle, you can create two treatment lagoons out of one, reducing expense and improving treatment conditions. The Environetics Director I is the only floating lagoon baffle system that features two load-transfer systems - one between the buoyant flotation collar and under-collar cable, and the other at the anchored anchored bottom ballast chain. 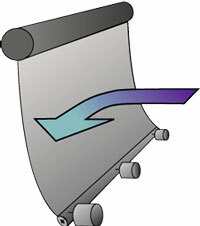 Other systems rely entirely on a tension member at the top - leaving the bottom of the non-anchored curtain to float free under high loads and reduce flow diversion. The Environetics Director I floating lagoon baffle system helps you direct lagoon flow in the most efficient pattern under light, normal, and heavy load conditions. Environetics floating baffles for lagoon treatment are available in HypalonTM, XR-3TM, XR-5TM, and PVC. Ask us which material is best for you. Environetics has operated continuously since 1970 and continues to lead the way in creating dependable, efficient flow controls and water-retention systems. Contact us for custom specifications and calculations.